Timmins Square from above. Image: Google Maps. When I set out to share more on The Margins, it wasn’t necessarily limited to my approach, time spent in the archives, or opinions. As I last wrote, I normally have a whole lot of stories stuck in draft mode with little chance of them coming out of that room any time soon. They will eventually, of course, but I felt it nice to be able to write about some of these topics without either (a) having to complete a story which may wind up somewhere north of 10,000 words; and (b) having to apply my normal referencing standards. Sometimes it’s useful just to have a chat about these things without research best practices in the way. It’s also an easier way to work through a topic and help to establish some kind of narrative arc that will help to establish a usable narrative arc later on, once I am ready to push it to the front. Of course, like my thesis on the Ottawa Lowren Housing Company, not every one of these is destined for the website. There are some topics that seem to be better placed in a different, more formal venue as there may be a larger (less marginal1Sorry.) point to be made. Last year, when I was digging into Ottawa’s strained relationship with Nepean over the late-closing bylaw (which benefited Nepean greatly during the postwar boom), I came across the issue of Jack Burnett’s Multi-Malls Inc. I want to stress again that, when I’m writing about topics in the blog section, the thoughts, ideas, and conclusions are tentative. They haven’t been fully researched or considered, and the citations are much thinner than I’d normally allow for. Nevertheless, as I’ll outline briefly below, I’ve come to suspect the Multi-Malls played a not-insignificant role in the wave of municipal amalgamations that took place in the province 20 years later, under the Mike Harris government. Put simply, the Government of Ontario had, during the Depression, come to be more involved in the administration of provincial municipalities than was earlier envisioned – or desired. Its burden only increased in the wake of the Second World War and the Multi-Malls saga only increased that administrative burden considerably. That likely would have been a tolerable situation had this longstanding and gradual adoption of administrative burden not often freed municipal governments from the burdens of measured governance. My own largest frustration is the Ontario Municipal Board (OMB), which is able to take on the role of “bad guy”, allowing ward-heeling municipal representatives to easily side with anti-development residents of their ward, knowing full well that the appeal body will hold Council’s feet to its planning fires. To be clear, and I know many disagree, but because of this I believe that Ontario absolutely needs the OMB. Without it, Councils will be emboldened to reject an adequate level of development to please its loudest, most privileged, and best organized constituents. We could “scrap it”, as the calls so often are, but the transition between a council confident enough to stand by its decisions will be a long one and many eggs will be broken in the process. Another one, which has come to be seen as a “solved problem”,2Due both to the creation of Regional Municipalities and later the wave of amalgamations. is that of intermunicipal relations. When it has come to ideological, capacity, or political asymmetries, in most cases, the province’s municipal governments have preferred to petition the Minister of Municipal Affairs or the Premier for a solution, rather than engage in productive relationship-building with neighbouring municipalities. The two-tier municipality solved some of the problems, but only those it was charged with solving: the accepted regional concerns like transit, policing, and sewage. The 1996-2001 amalgamations only really papered over some of the tensions, knocking the battle down to a sub-municipal level instead of an intermunicipal one. Multi-Malls was the source of quite a reaction. Source: The Globe and Mail, January 1, 1974, p. 25. So, getting to the point, Multi-Malls was a developer of shopping malls. Run by fruit dealer Jack Burnett,3”From food to finance in one generation,” The Globe and Mail, May 11, 1974, p. 3. the company was mostly dedicated to bringing the modern shopping mall to the province’s smaller cities. Burnett would target the “many large towns and small-to medium sized Ontario cities” that were “ready for modern shopping plazas.”4Peter Moon. “Must control major developments; 70 municipalities face loss of planning powers,” The Globe and Mail, January 1, 1974, p. 25. Although the story of the province’s postwar urban development is focused on cities like Toronto and Hamilton,5Ottawa-the-City tends to be left out in favour of narratives focused on Ottawa-the-Capital., there was much wealth to share and Burnett was more than well-aware of it. Cities like Chatham, Barrie, Peterborough, and my own hometown cities of South Porcupine and Timmins were recipients of Burnett’s projects. What’s the problem then? Burnett had a method to his madness. By the time he got into the business, Ontario’s municipalities had come to face a population that was “tired” of development. By the early 1970s, the province had experienced nearly 20 years’ worth of rapid development with no end in sight and local populations endeavoured to lift the drawbridge. To that end, a number of these smaller cities and larger towns developed official plans that – like today – were more attempts to control and restrict growth. The trouble? In 1972 Ontario had created a slew of two-tiered municipalities, such as Ottawa-Carleton, Peel, and Wentworth, but did not amalgamate its numerous smaller locales. As such, Burnett, when faced with a less-friendly municipality, would “offer” his new shopping mall to the neighbouring Township municipality. As is so often the case today, rural areas tend to be somewhat more libertarian than their urban or suburban counterparts. When Burnett came a’knockin’ at those township offices, there was little will to tell the retiring farmer he could not do with his land as he pleased. Even in the event that there was, most of these small township municipalities had a nominal planning capacity at best. Generally, most did not have a land-use bylaw. As such, it was not particularly difficult for Burnett to engage in a little development arbitrage, make his way up the county road, and find himself in a much more friendly context. Suffice to say, this created one heck of a headache for the Province. With Burnett running around the province setting up malls just outside of city – planning – limits and those cities and large towns kicking up a stink, Municipal Affairs was left with a stinking-herring problem. After warnings in December 1973,6Peter Mosher. “Produce land-use bylaws or face a development freeze, White tells 31 municipalities,” The Globe and Mail, December 4, 1973, p. 4. January 1974,7Moon, January 1, 1974, p. 25. and February 1974,8”White urges planning; Municipalities warned on haphazard growth,” The Globe and Mail, April 27, 1974, p. 12., then Minister of Housing Sidney Handleman issued orders in 62 municipalities blocking the development of shopping plazas.9Thomas Claridge. “Ministerial orders block plazas in 62 municipalities in Ontario,” The Globe and Mail, April 27, 1974, p. 12. The sin of the 62 frozen? They lacked official plans. In any event, this is how I’ve come to see the move toward the province’s amalgamations in the 1990s. With the pressure that Multi-Malls placed on Municipal Affairs and the additional planning responsibilities adopted by a province trying to placate established municipalities, the office was saddled with a burden it didn’t particularly want. This was likely a fine move to make when, as Darcy McKeough suggests, deficit spending was a negligible problem with the province’s cash flow in the 1970s. By the 1980s and 1990s, however, it was clear that Ontario was quite anxious to diminish its responsibilities, downloading many of them to municipal governments in the 1990s. If the largest municipalities had an adequate (potential?) tax base, then they’d likely be able to shoulder the burden.10I’ve also been normally of the belief that the more “socialist” old cities were understood somewhere in the Premier’s office to have a good match in the normally-conservative and more affluent suburban municipalities. The urban/suburban split showed pretty quickly and amalgamation would serve as a good foil that it could not in the context of a regional municipality. As a reminder, these are very early thoughts. They are largely based on drawing a line between a province that suddenly began to feel the burden of taking on municipal planning functions in 1974, assessing that they were too great to take on, and looking for a way out of it. One side note is that some cities faced this more quickly. Port Arthur and Fort William, for example, were amalgamated into Thunder Bay in 1970. Timmins was amalgamated with Tisdale and Whitney Townships in 1973 and given several other townships to expand the tax base. When I arrived in Ottawa in 2000, it was still technically part of a two-tier municipality, though in 2001, the amalgamated City of Ottawa was born. I’ve come to believe that the amalgamated Thunder Bay and Timmins served as something of a lesson for the province in amalgamations going forward. 2. ↥ Due both to the creation of Regional Municipalities and later the wave of amalgamations. 3. ↥ ”From food to finance in one generation,” The Globe and Mail, May 11, 1974, p. 3. 4. ↥ Peter Moon. 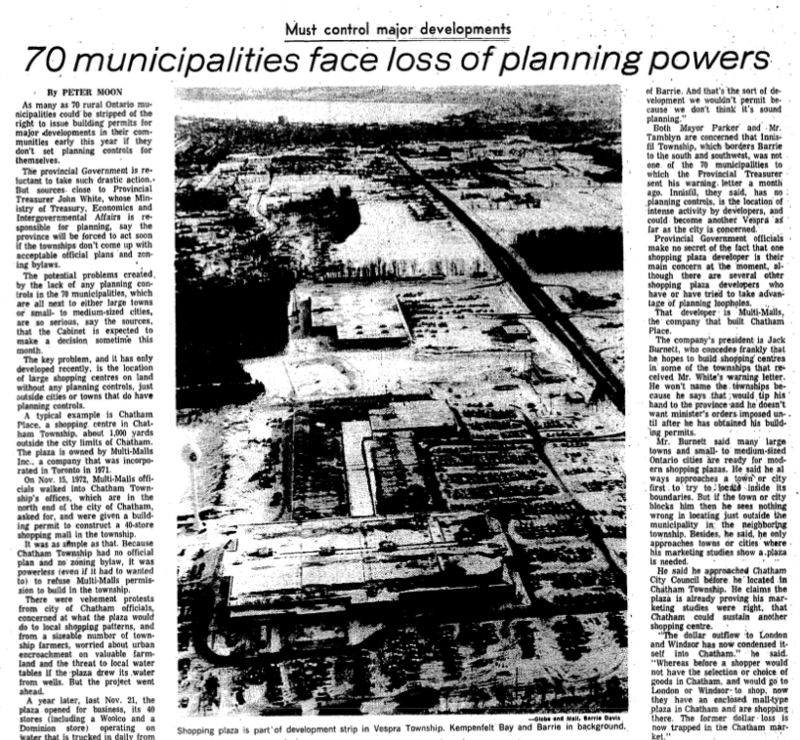 “Must control major developments; 70 municipalities face loss of planning powers,” The Globe and Mail, January 1, 1974, p. 25. 5. ↥ Ottawa-the-City tends to be left out in favour of narratives focused on Ottawa-the-Capital. 6. ↥ Peter Mosher. “Produce land-use bylaws or face a development freeze, White tells 31 municipalities,” The Globe and Mail, December 4, 1973, p. 4. 7. ↥ Moon, January 1, 1974, p. 25. 8. ↥ ”White urges planning; Municipalities warned on haphazard growth,” The Globe and Mail, April 27, 1974, p. 12. 9. ↥ Thomas Claridge. “Ministerial orders block plazas in 62 municipalities in Ontario,” The Globe and Mail, April 27, 1974, p. 12. 10. ↥ I’ve also been normally of the belief that the more “socialist” old cities were understood somewhere in the Premier’s office to have a good match in the normally-conservative and more affluent suburban municipalities. The urban/suburban split showed pretty quickly and amalgamation would serve as a good foil that it could not in the context of a regional municipality.